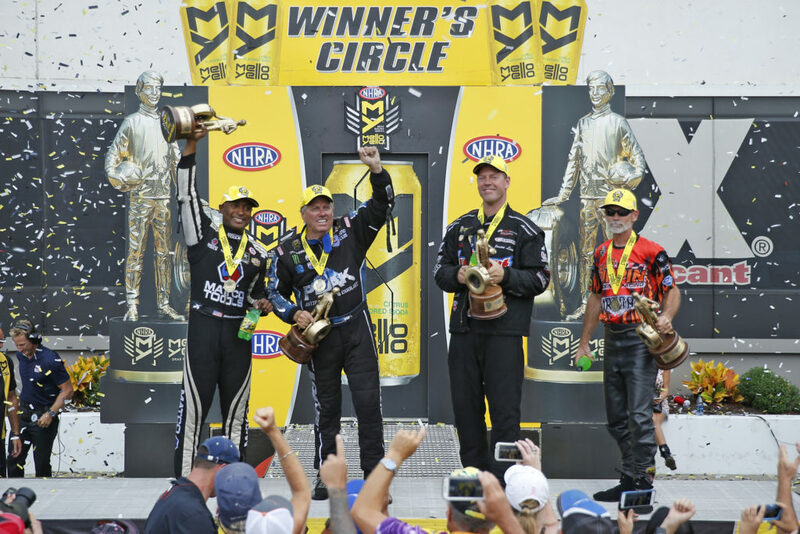 Antron Brown is making it perfectly clear that his campaign to win his third Top Fuel title is off to the right start, winning the NHRA Carolina Nationals at zMAX Dragway. Likewise, 16-time Funny Car champion John Force is striking like lightning, winning for the 146th time, proving the 67-year old is incomparable and thinks the number 17 has a nice ring to it. Jason Line proved his team’s KB Racing Chevy Camaros are back to championship form, taking his eighth Pro Stock win of the season. Surprisingly, Chip Ellis won again in Pro Stock Motorcycle, his first since 2008. 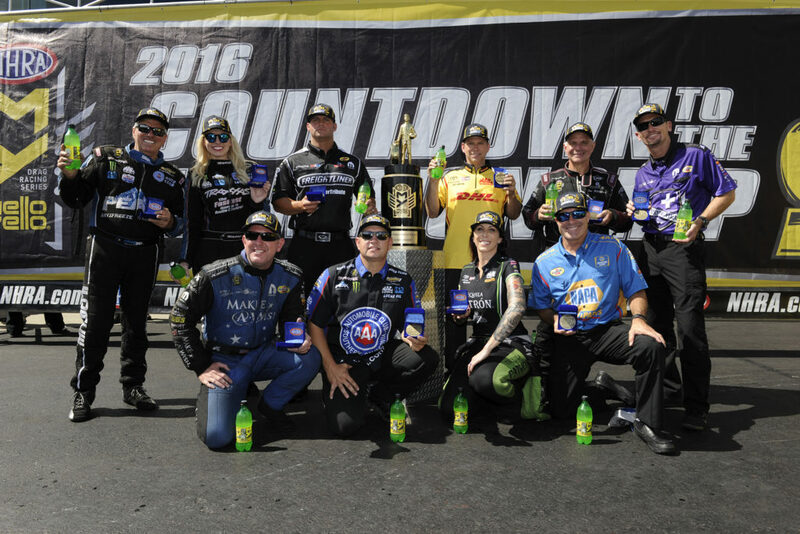 The Don Schumacher Racing Top Fuel team of Antron Brown is starting the Countdown to the Championship with a win at zMAX Dragway near Charlotte just as he did in 2015, propelling him to his second NHRA title. 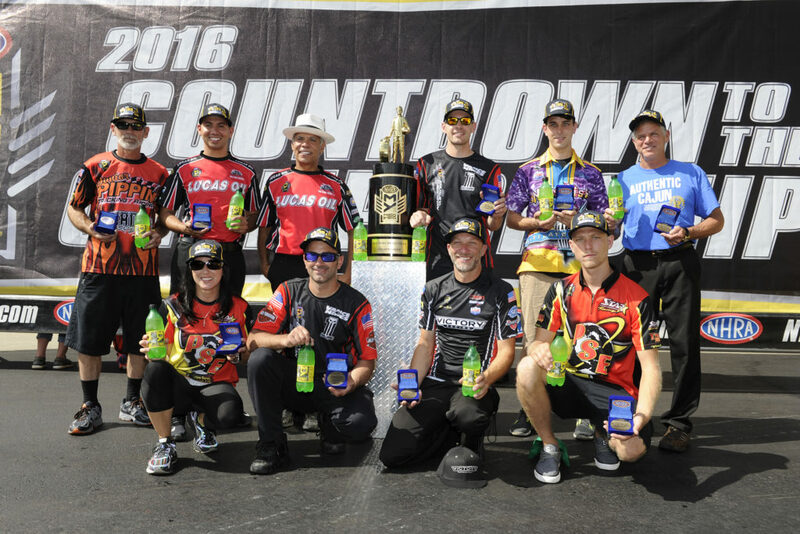 Brown’s Matco Tools team kicked off the six-race sprint to the Top Fuel world championship by defeating Clay Millican, Brittany Force, Pat Dakin and Doug Kalitta en route to their fifth win in nine final round appearances through 19 NHRA Mello Yello Drag Racing Series events. It was his 43rd Top Fuel win and 59th overall, combining with his Pro Stock Motorcycle victories. “I’m dreaming right now; somebody needs to come pinch me,” laughed Brown. “The thing about it is, when you come here this is the way you want to start the Countdown off. We just keep digging. That was the key. In the Top Fuel final against Kalitta, Brown powered his way to victory with a time of 3.763 seconds, 319.28 mph to best Kalitta’s 3.811-second pass at a speed of 320.28 mph. Brown now heads to St. Louis, going for his fifth straight win at Gateway Motorsports Park next weekend. He benefited with the win, already having a 30-point advantage going into the Countdown as the No. 1 seed, extending his lead over Kalitta to 42 points. 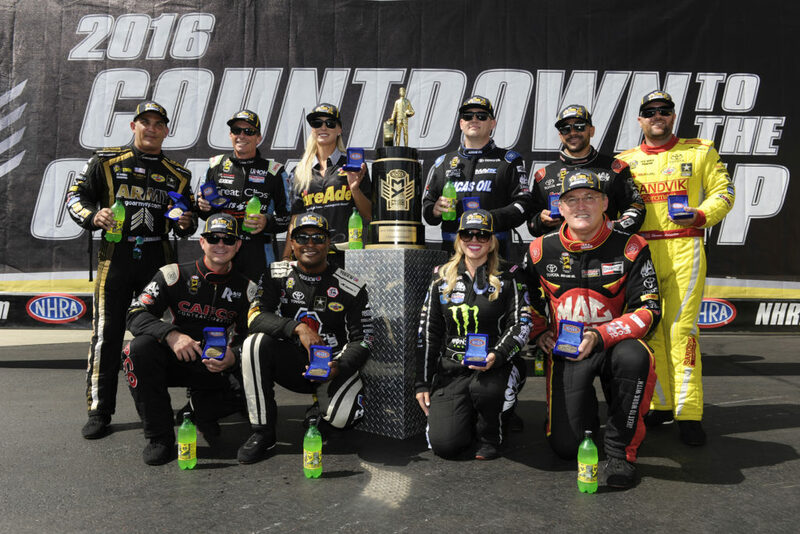 The Countdown points were jostled around, with Richie Crampton getting beat by Leah Pritchett and Cameron Ferre in his first round of Top Fuel competition, upsetting eight-time champion, Tony Schumacher. Wayne Newby took out Shawn Langdon and Pat Dakin beat J.R. Todd. The Top 10 are as follows: Antron Brown, Doug Kalitta (-42); Steve Torrence (-100); Brittany Force (-116); Tony Schumacher (-127); J.R. Todd (-152); Shawn Langdon (-159); Leah Pritchett (-172); Clay Millican (-174) and Richie Crampton (-216). 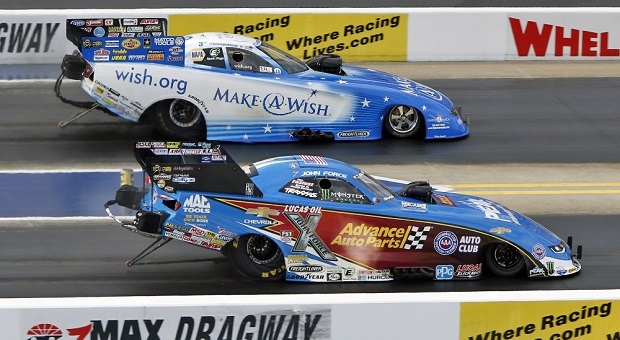 John Force has made is very clear that he’s not ready to write the final chapter of his stellar career after winning the first round of the NHRA Countdown to the Championship at the Carolina Nationals. He beat Tommy Johnson, Jr. in the finals for his 146th National event victory in a classic 3-second side-by-side race. In the final, Force and Johnson Jr. left the starting line together but by about 700 feet Force was driving around Johnson Jr. and getting to the finish line first with a winning elapsed time of 3.946 seconds at 324.05 mph, edging out Johnson Jr’s 3.987 second, 315.71 mph run. “We have a lot of work cut out for us,” said Force in his post race press conference. “We’ll be testing here all day tomorrow. You win a race and you still come right back and you test. I’m excited. Marching through eliminations took Force up against Dave Richards, Tim Wilkerson, Ron Capps and Johnson in the finals. “I have a race car now that I can race with, and when you get a race car and you’re on your game I can win. Tommy Johnson flew all weekend; he outran us but I was right in the hunt with him. (Ron) Capps in the semis, I love to race him. At the end of the day it was just a fight and we got the win, and we’ll just take it from here,” added Force. For Johnson, Jr., it was a repeat of the final round last year at Charlotte coming up short against Del Worsham. “Peaking at the right time is what we came in here saying we needed to do, and I think we showed that we’re ready to peak,” Johnson said, tuned by crew chief John Collins and assistant Rip Reynolds. Upsets in Funny Car came from John Bojec defeating Alexis DeJoria in the first round, and high profile matchups with Matt Hagan vanquishing Courtney Force, and defending Funny Car champ Del Worsham beating last year’s runner up in the points, Jack Beckman, all in the opening round. With five races to go in the Countdown, Force jumped from eighth to third in the points after Charlotte. The following are the current standings: Ron Capps, Del Worsham (-42); John Force (-50); Tommy Johnson, Jr. (-62); Matt Hagan (-72); Courtney Force (-100); Robert Hight (-101); Jack Beckman (-110), Tim Wilkerson (-127) and Alexis DeJoria (-158). It was the ninth final round appearance for both KB Racing Chevrolet Camaros and for Jason Line in Pro Stock; this is his eighth win of the season. He raced his Summit Racing Equipment Chevy Camaro to a winning pass of 6.621seconds at 209.39 mph to defeat teammate Greg Anderson and his Chevy’s close losing run of 6.639 seconds at 209.20 mph. “It was a great day for us,” said Line, whose race shop is just 20 minutes away. “To be sitting here is a great feeling. It’s a great way to start the countdown. If you want to win the championship, you have to come out smoking, and somehow we were able to do that today. It was Line’s 45th Pro Stock win and is now 15 – 18 in final round head-to-head match ups and 30 – 35 overall against his KB Racing teammate, Anderson. It was his second zMAX Dragway fall win and sixth in the Countdown. Line, a two-time world champion, powered past Shane Tucker, teammate Bo Butner and Vincent Nobile before defeating Anderson, who picked up wins against Alan Prusiensky, Chris McGaha and Alex Laughlin in the earlier rounds. The teammates remain one and two in the points standings, respectively, separated by 50 points. Bo Butner (-104) is third followed by Allen Johnson (-138) and Chris McGaha (-151) rounds out the top five in the Mello Yello Pro Stock points standings. Chip Ellis rode his Junior Pippin Motorsports Pro Stock Motorcycle Buell to a time of 6.879 seconds at 194.88 mph to defeat points leader Andrew Hines and his Vance & Hines Harley Davidson’s 6.908 at 193.49 in the final. Ellis has seven wins in his Pro Stock Motorcycle career with his last win coming at Englishtown, N.J. in 2008. In the earlier rounds, Ellis defeated Shawn Gann, LE Tonglet and No. 1 qualifier Angelle Sampey to reach the finals. Hines maintains the points lead and Ellis jumps to the number two spot. The Top 10 in Pro Stock Motorcycle sees Andrew Hines holding a 44-point lead over Ellis. He’s followed by Angelle Sampey (-49), Eddie Krawiec (-85) and LE Tonglet (-99) rounding out the top five. 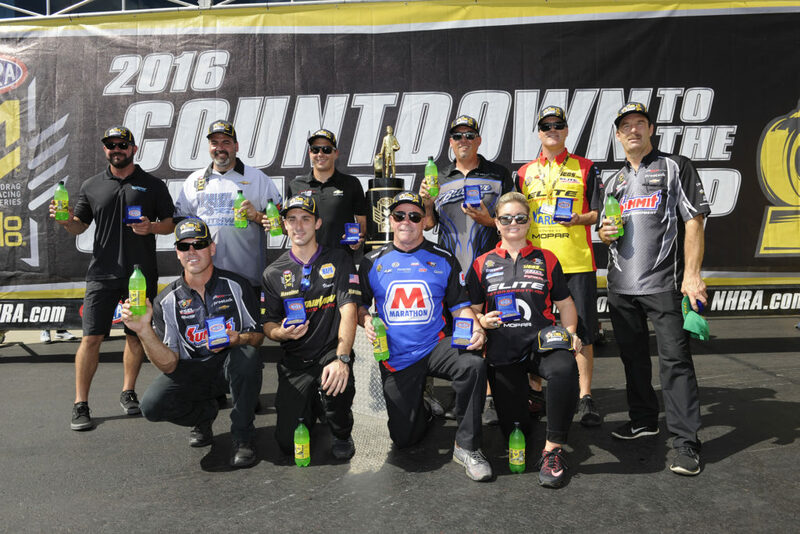 NHRA Mello Yello Drag Racing will continue at the AAA Insurance NHRA Midwest Nationals at Gateway Motorsports Park in Madison, Ill., Sept. 23-25.